Starring: Bruce Willis (R.E.D. 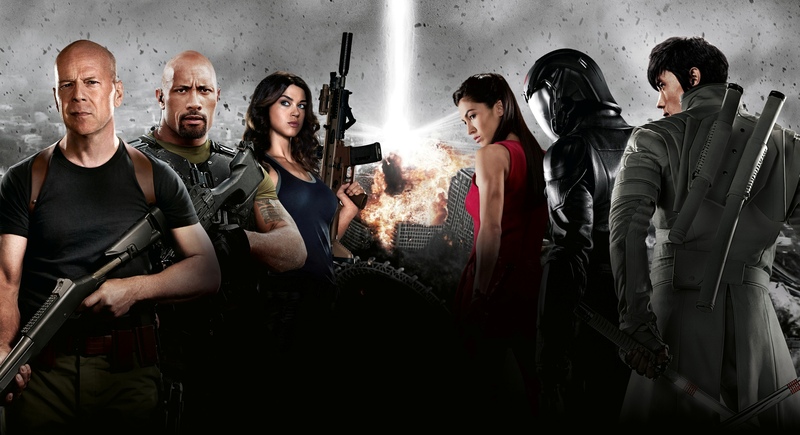 ), Dwayne Johnson (Fast Five), Adrianne Palicki (Red Dawn) and more. Rated: Rated PG-13 for stylized action, language, intense sequences of violence and sensuality. A different format this time around. It had been a while since I had watched the prequel to this film (G.I. Joe: Rise of Cobra), so a few hours prior to my sneak peek preview of the continuation, I trudged through the first one again to refresh my memory. I even tweeted about it. BTW, I like the poster I used for this review. So many of the ones for this movie were horrible, or just character posters, or contained terrible photoshopping, but I like this one because of its balanced opposites. Fire/Ice, Good/Bad, White/Black, Color/Coldness, Bald/Beautiful hair, hahaha. Just exactly what will happen with Duke? Why is Storm Shadow still alive? How are they going to explain the absence of Scarlett, General Hawk, Ripcord and Heavy Duty? Will we see Paris rebuilt after the Eiffel Tower’s destruction? Jinx better tear it up…I’m just sayin. Oh, and will the White Stripes version of “Seven Nation Army” actually play in the movie like it did in the 1st trailer? Looking forward to how Dwayne Johnson, Adrianne Palicki and Ray Stevenson fit in here. JGL replaced by Luke Bracey? Who in the world is Luke Bracey? I guess it doesn’t really matter. Cobra Commander wears a mask! There better be much better CGI in this one. The first one was horrible. Please, director Jon M. Chu, don’t let me down like Stephen Sommers who directed the first one. I mean, Sommers did The Mummy and Catch Me If You Can, so I had higher expectations and he failed me. Mr. Chu, you won’t, right? I mean, let’s look at what you’ve directed. It’s gotta be great, right? Can I retreat from this battle now? Picks up well enough from the first one with a cool explanatory intro that explains little to nothing. 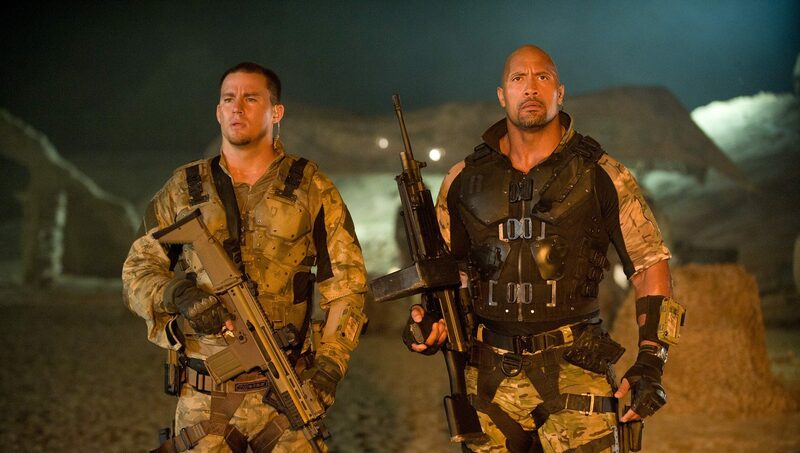 Dwayne Johnson: I like him in these type of roles. It’s too bad they are all the same. Exciting technology plays a vital role continually and it’s cool to see throughout. 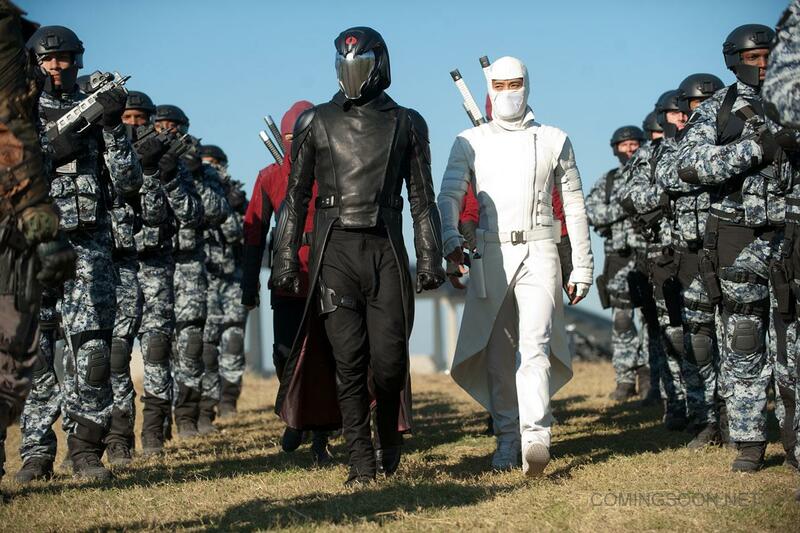 Okay, I expect a lot of people to die between Snake Eyes AND Storm Shadow in this film. This movie is stale. Moving at a slow pace. Where’s Joe? It’s boring me, but at least there is no real bad CGI like in the first. Okay, 2 more lame things: The bad weapon is named ZEUS? Really? and RZA (Man With The Iron Fists) is in this movie? really? why? When it comes to new characters, I like Jinx and Firefly. They’re cool. Firefly’s signature arrival is pretty neat, but Ray Stevenson is grossly underused. So is Lady Jaye, but she is mainly here for looks (not complaining)! Accelerated plot through simple uncovering of the “President” is evidence of questionable/lazy writing. When will this movie actually start to take off? I’m bored. 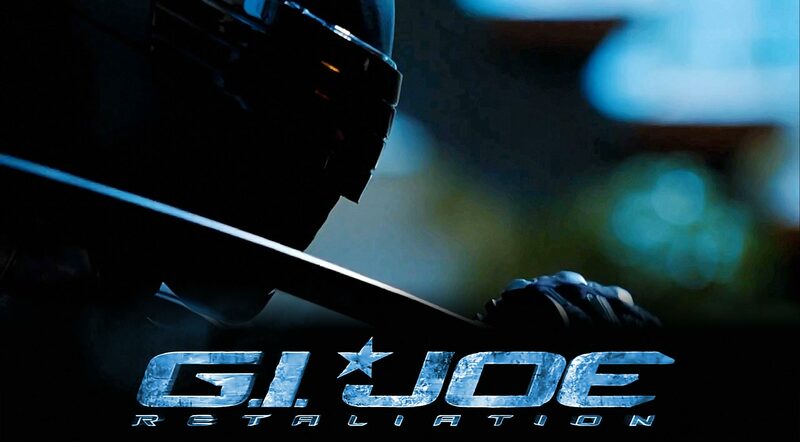 I know there’s more action (thanks again, GI JOE 2 trailers). 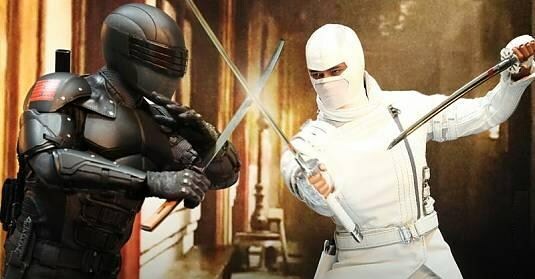 Storm Shadow vs. Snake Eyes!!! YES! More lazy writing! Really? Using the “poor misunderstood lonely soul” excuse for a bad guy. YUCK. Cool to see Cobra Commander. Too bad he disappears for over 35 minutes before we see him again. So many characters in this movie are useless: Flint, Blind Master, Mouse, and even Joe himself…at least Lady Jaye is pretty. Again, RZA needs to go, he hurts this film even more with his misplaced presence. We know he likes Kung Fu…go like it somewhere else. Don’t get used to Joe or Cobra Commander. They don’t show up much. Mix James Bond movies with Fast Five, R.E.D. and Die Hard and plenty of boring characters and scenes of non-action and we get this snorefest. Only things that make it good: Snake Eyes, Storm Shadow, Cobra Commander, Lady Jaye and Jinx [for obvious reasons: their fighting skills ;)] and the end credits. 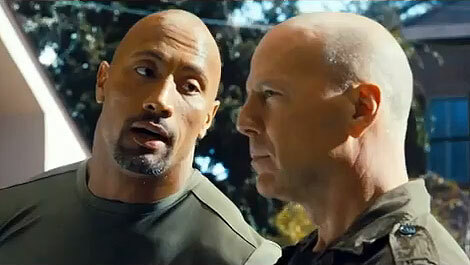 Thanks Bruce Willis and Dwayne Johnson for not being any different than you have been in so many other roles. LAME-sauce. What was the point of almost anything in that movie? Not nearly enough Cobra Commander (the film was better when he was on screen), the whole “nuke” angle was pointless and did they forget about Joe? This movie was pushed back for more reasons than just “3D enhancement.” The studios must have wanted to push it back and forget about it, but contractually couldn’t so they just delayed the inevitable for a little bit longer. That clearly must be what happened. Jon M. Chu, you let me down, and that was difficult for you to have done given I already didn’t expect much. At least there wasn’t any street dancing. And I am very disappointed in realizing the answers to a lot of my “Pre-Viewing” questions. A few cool moments here and there to spark up some interest, yet they only serve as teases left unfulfilled by the events to follow. Bad plot that ultimately amounted to nothing at all, bad use of several characters, bad choice of which characters were highlighted, good action when it was on screen, better CGI, ultimate letdown. I’m not certain at this point which one I like less, Rise of Cobra or Retaliation. At least in Retaliation there is more Snake Eyes vs. Storm Shadow. When will Hollywood get it right when it comes to childhood favorites? Transformers, The Flinstones, G.I. Joe, Smurfs, Inspector Gadget, Garfield, Teenage Mutant Ninja Turtles! ??? I’m out! 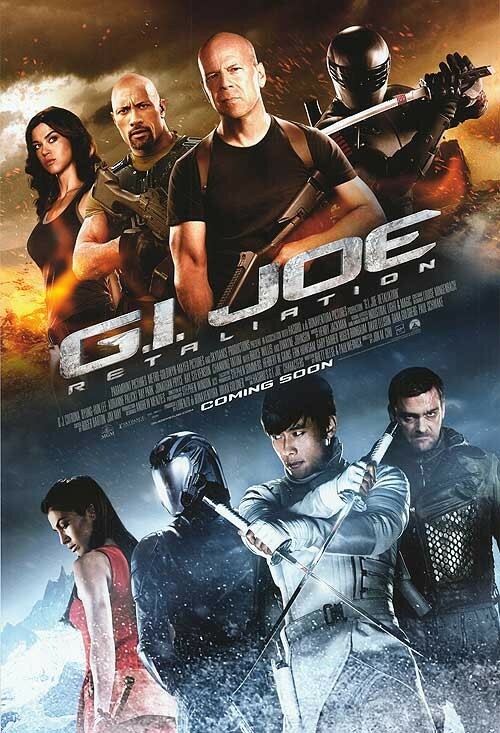 (Just like “Seven Nation Army” was out of this film…and as almost everyone else from the first one was) Duke: General Hawk, you think GI Joe: Retaliation gonna be any good? Ripcord: How you gonna ask him that, Duke? It doesn’t have most of us so…of course it will be good! Snake Eyes: If they only knew…It’s only good when I’m onscreen! up next: “Trailer Time Thursday” and the “Lammys 2013”! You don’t want to miss it. Ouch!!!! Sounds like I was right in flushing this one!!!! I still have not seen the first one, sounds like I am not missing much. you’re not. really. and I am sad to have to report as such. Nice review. I think I’ll be skipping this one. Also, I just realized I accidentally reblogged this post. Thanks to all so far for the comments. I am at work and will reply to all soon. Thanks for reading. Have a great day. Aw man, that’s so disappointing to read. The ninja scenes looks so sick from the trailers and extended clip. But I could also tell that all the other characters paled in comparison to the ninjas. I was looking forward to this. You gave this a 1.5 out of 5 stars but I’m curious, what would you give Rise of the Cobra? I actually liked part 1 and didn’t mind the CGI at all so that’s why I ask. Loved your rant at the end about our childhood toys and cartoons from the 80’s and 90’s. I could not agree more! Don’t forget Battleship. What were they thinking?!? it was just as disappointing to write. the ninja scenes were very cool (except the mountain side one was rather ho-hum actually). I liked GI Joe growing up, and really was disappointed with the first one. It only served really as a stepping stone setup to Retaliation…and that disappointed too. i did, Tim. I did. The trailer seemed OK, “Seven Nation Army” electro cover is good…maybe some street dancing would have helped? Hi Paula! Thanks for stopping in. You know, now that I think about it, you may be right. Street dancing may have helped afterall. haha. Ted and your hubby are kindred spirits indeed. hahaha. I am curious about RED 2 myself. More sad that there’s no Morgan Freeman. Urban is getting so much work lately, it’s bittersweet when you know he can’t be in everything. You and I are in total agreement here T., I kept looking at my watch since I wanted the film to end fast! Got it was awful and the 3D was even worse. When I saw RZA appeared as a blind ninja master, I was like WTF! Was that supposed to be a joke? And don’t get me start on Chu’s direction, the man doesn’t know how to stage exciting action sequences; all of them felt like they were stitched together by the editors in the last minute. RZA was useless. I had to do a dbl take when I first saw him too. just a sad disappointment again. ha. Glad we are in total agreement here, Ted. Thanks for the comment. I’m not saying there weren’t a cpl aspects that were mediocre/okay, but overall…NOPE. Sadly John M. Chu is working on the He-Man movie. Not too many surprises here with this one! Will definitely be avoiding this one, cheers for the heads up! A director without credentials, actors that have never been in a good film and no positive reviews. It sounds like I’m gonna stay well away from this. I think I’ve outgrown the whole superhero/childhood cartoons turned to films. I’m ready for the next thing Hollywood can come up with to make bank in the box office (and they desperately need it). Studios should stop trying to make films like these appeal to as wider an audience as possible. At the end of the day, they just end up making pretty awful movies. Nice effort with the live blogging. I enjoyed it. ha. thanks for the kind compliment on my attempt at “live blogging.” I hope to do it again soon. Ouch. Scathing indeed. Admittedly, I was always going to have lower expectations about this one since the first one was just a total trash-heap of ideas and creativity. I’m still keen to see this, but I think it’ll be a rental on Blu rather than a trip to the cinema. Nice work, Terrence…. yes. I wanted it to be better…this one was less of a trash heap than the first one, but not by much! I actually was pretty happy with this one, even though I do completely agree with the points you make against it. My point of view is that it’s a GI Joe movie so there’s only so much intelligence that makes sense to feature, but as far as dumb fun went I thought it did a perfectly acceptible job. If I were to agree with any of your points more than others though it’s that RZA was TERRIBLE. His line reading was so wooden I could’ve sworn they accidentally used one of the bad takes for his readings. Just came back from seeing this and I can agree with you review. I don’t expect much from action movies but this was really disappointing. Almost none of the jokes worked and the 3d didn’t help the frantic action. yep. sad too. I wanted so much more Cobra. Glad to see a different opinion here. Interesting that we agree yet still felt different about it ultimately. It is a popcorn flick, no doubt! and RZA was so bad wasn’t he? I wonder why in the world he got into this movie. Thanks for sharing your thoughts. I love seeing other perspectives. Appreciate ya taking the time. I enjoyed the hell out of it, was it well written? nope, but neither was Avengers, they both relied on special effects to drive a plot. The tortured bad guy that is Storm Shadow stuck with the cartoon from my youth, and if you’re going to rip on them for that jump on Loki for the same reason. Just sayin…. Hi Moose, welcome. Thanks for stopping in to share your thoughts. a fair point about Loki, but at least they brought that out a lot better in The Avengers…and at least it was more central to the film as a whole. In this, it served little to no purpose at all. Glad you enjoyed it. You are one of the few. Appreciate the comment. Ahahahahaaa! Laughing at ur views of the director and the earlier movies he has directed…hilarious. U asked alot of the questions I asked after I left the theatre…especially RZA…wth. I could not understand his purpose. And did Storm Shadow not die at the end of the first film? Bruce Willis was also a waste of time. He’s always in “Die Hard” character lately…smh. I didn’t like this movie half as much as I liked the first one. There were way too many new characters and none of them caught my interest. I hope this is the last we see of the Joe’s. I see your point on the new characters as opposed to the character development in the first, and you’re right. boo to that. Glad you agree on RZA…he was pointless. and, sadly, so was Willis.